Two recipes for a sauce to accompany grilled mackerel or roast pork, both from Nigel Slater’s Tender Vol. II. The second one makes use of elderflower cordial and ginger – an idea taken from Yotam Ottolenghi. Makes enough to accompany grills mackerel or roast pork for six. 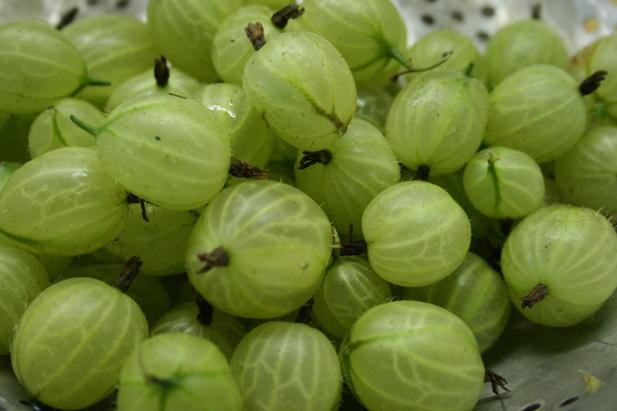 Top and tail the gooseberries, tip them into a stainless steel pan, then add the sugar and water. Bring to the boil, lower the heat and simmer for ten minutes. Use warm or at room temperature. Top and tail the gooseberries and tip them into a pan with the sugar and cordial. Peel and coarsely grate the ginger and add to the pot. Bring to the boil, turn down the heat and simmer for ten minutes. Serve with pork or oily fish.